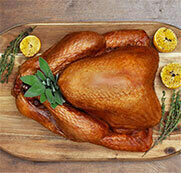 Dark turkey meat is considered a favourite for those that know that this meat is particularly moist. Often bypassed by white meat lovers, the dark turkey meat is tasty and nutritious in its own right. Grab a drumstick today!